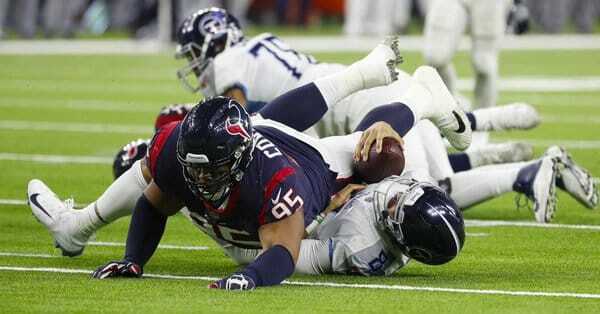 On Monday Night Football, the Tennessee Titans were defeated by the Houston Texans 34-17. Marcus Mariota did not thrown an incompletion until less than a minute to go in the game. Once again, it was the lack of execution by the players around Mariota that resulted in a lopsided defeat. The Texans extend the winning streak and lead continue leading the AFC South. All season the Titans have been searching for a playmaker. 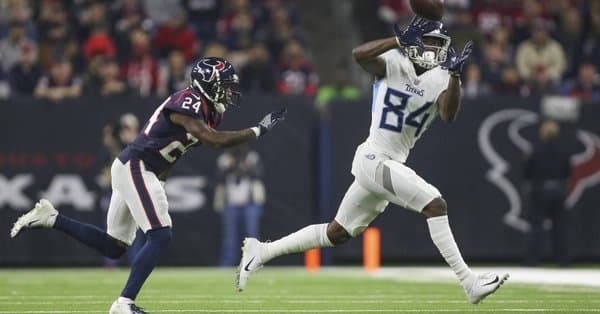 WR Corey Davis (#84) is slowly developing into a reliable option for QB Marcus Mariota. However, Davis tends to have big games then disappears for weeks at a time. Corey Davis caught all 4 of his targets tonight for 96 yards 1 TD and added a run for 39 yards. Outside of Davis, the Titans do not have anyone they can trust with the football. RB Dion Lewis ran for 8 yards on 7 carries and 33 yards on 7 receptions. Fellow RB Derrick Henry ran for 30 yards on 8 carries and 19 yards on 2 receptions but fumbled the last possession. Derrick Henry was also targeted on the history-snapping only incompletion of Marcus Mariota. Last week I stated: you know the old saying, “The game is won or lost in the trenches?” This statement was never more true. The Titans offensive line is a fraud. In 2016, the Titans were hailed as being a top-3 offensive line and all the players were young. Fast forward to 2018, and the TItans have allowed the most sacks in the NFL. RT Jack Conklin, an all-pro his rookie season, is the worst lineman on the team now. Tonight was more of the same. The Titans offensive line allowed 6 sacks for -49 yards with Jack Conklin leading the way. The Titans also had 7 penalties for 50 yards and most of those were against the offensive line. Last week Monday Night Football rewrote history with the high-scoring Rams-Chiefs game. This week, Marcus Mariota was on pace to finish the game with 100% completions. Inside the final minute during “garbage time,” Mariota threw his only incompletion in the flat to Henry. Mariota was great across the board in the passing game. He was not perfect–he still continues to hold onto the ball too long at times–but he was the only good thing for the Titans in prime time this week. Mariota threw a dump off to TE Jonnu Smith who did the rest of the work on an early 61-yard TD reception. Mariota also completed a beautiful deep pass to WR Davis for a 48-yard TD in the 3rd quarter. This season the grumblings among the fans has been that Marcus Mariota should not be the future QB of the Tennessee Titans. This game proved to the entire country that Marcus Mariota is not the problem. When healthy, he is a weapon. The offensive line is the biggest liability on the team leading to a lack of consistency with the offense. Look at the difference in talent around the QBs in tonight’s game: Texans QB DeShaun Watson has weapons around him. DeAndre Hopkins is one of if not the best WR in the NFL. DeMaryius Thomas is a top-50 WR in the NFL along with Will Fuller V (who is now on the injured reserve). RB Lamar Miller added 162 yards on 12 carries and 1 TD. Reserve RB Alfred Blue gained 49 yards on 13 carries as well. The Titans RB gained a combined 38 yards and 1 fumble! Marcus Mariota finished the game with 21/22 completions (96%), 308 yards, 2 TD, 147.7 QB rating, and 28 yards rushing. This season head coach Mike Vrabel has proven to be a risk-taker. However, there comes a time when you cross a line. 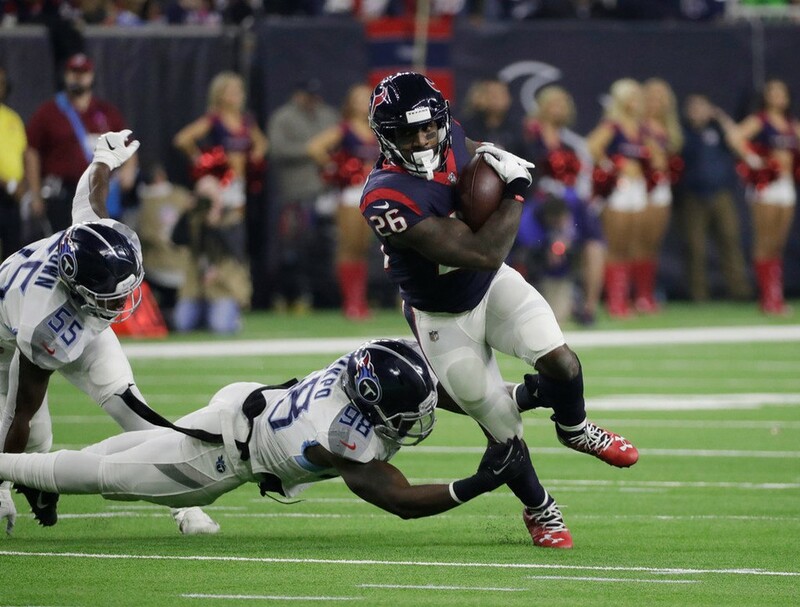 The Titans were trailing 14-10 and faced a 4th & 1 inside the Texans 5-yard line. The decision to go for the first down is debatable but acceptable. However, for the second consecutive time, the playcall in this situation was so bad it deserves to be followed with a pink slip. The first time against the LA Chargers in London, the Titans scored a late TD and decided to go for the win with a 2-point conversion. After a flag on the defense, the Titans elected to throw into a crowded middle zone on a slant to the smallest, lightest WR on the roster, Taywan Taylor, who had struggled with drops in the game. Of course, the play resulted in a loss. Remember, there is a Heisman-winning, 6’4”, 247lbs RB in Derrick Henry on the roster. Why not go to Henry in that situation? Against the Texans, the Titans elect to hand the ball to backup TE Luke Stocker for his first career carry. If you didn’t know the outcome, you can guess the play was stuffed. The very next play Lamar Miller carried the ball 97 yards for a TD and essentially killed any chance of an upset win for the Titans. Coming into the game, the Titans only had two legitimate WRs on the roster. WR Corey Davis and WR Tajae Sharpe with WR Tayan Taylor being injured. Cameron Batson (#17) and Darius Jennings (#15) also made the trip but serve as punt returners. How can you have an NFL team and only have two viable WRs on the roster? That is inexcusable! Early in the game, Tajae Sharpe was injured leaving only Corey Davis as a viable WR on the entire team. Despite all of this, QB Marcus Mariota still nearly set an NFL record with 100% completions. GM Jon Robinson needs to be held responsible for an atrocious job at roster construction. He passed on obtaining WR Demaryius Thomas from the Denver Broncos at the trade deadline. The rival Houston Texans acquired Thomas. Thomas had 2 TD against the Titans on Monday Night Football. (Don’t forget the questionable move of firing a head coach that won a playoff game–the first in 15+ years for the franchise–for a first time head coach). It may be time for the Titans to move on from the poor manage plaguing the team. After the loss, the Titans’ chances of returning to the playoffs are slim to none. Every game becomes a must-win for the Titans at this point.